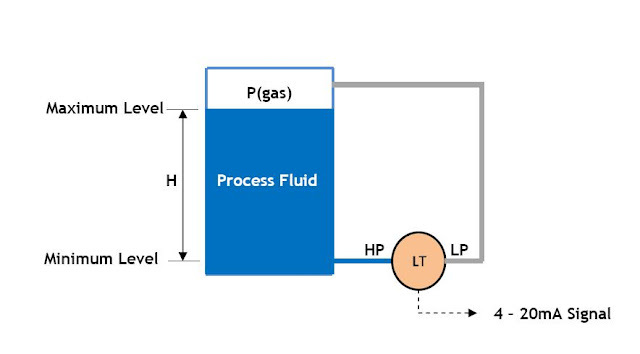 As shown below, in a close tank level measurement installation, if a gas phase exists on top of the liquid, the gas pressure must be compensated for. As seen from the calculation above, the effect of the gas pressure is cancelled and only the pressure due to the hydrostatic head of the liquid is sensed. The low side transmitter piping that provides the reference connection is called a dry leg condition. This connection will remain empty if the gas above the liquid does not condense. In this closed tank application with a dry leg condition, if the level transmitter is mounted at the base of the tank, then it can be calibrated with the 0% level = 4mA and the 100% level = 20mA. Note that ΔP is measured in inches of water column (in wc). If condensation of the gas above the liquid does occur, then the low side of the transmitter piping will accumulate liquid leading to potential errors in the measurement. To prevent this from happening, the low side of the transmitter piping is purposely filled with a convenient reference liquid (either the process liquid or some compatible material) to eliminate this potential error. This is called a wet leg condition. In a wet leg condition, the reference liquid will exert a head pressure on the low side of the level transmitter. To account for this, the level must be determined and the negative effect of the reference leg must be subtracted. The resulting calculation will result in a negative calibration. Such calibrations are said to have an elevated zero as we shall see in Zero Elevation Calibration in Level Measurement.